How does Argyle Winery celebrate its new Tasting House and hospitality center? With sparkling wine of course! 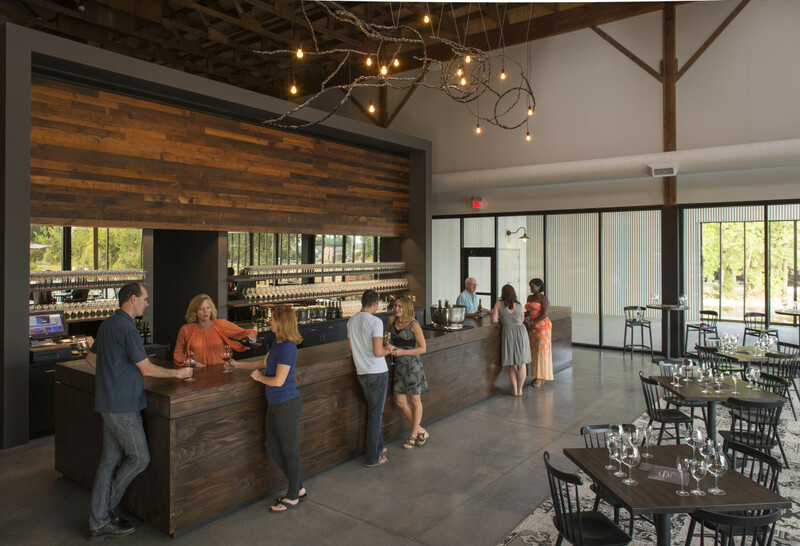 Located in the heart of downtown Dundee, the hazelnut processing facility turned award-winning winery has been transformed once again. The new Tasting House, located directly behind the Victorian farmhouse that’s been Argyle’s popular tasting room for decades, provides a chic and expansive (note: much larger) space. Visitors will be able to taste, learn, gather and relax at the contemporary Tasting House bar or at one of many indoor and outdoor seating areas filled with light and warmth. Making it truly one-of-a-kind in Oregon, the Tasting House was designed to be a destination that attracts a vibrant, kinetic community interested in hearing (and tasting) the Argyle story. Leveraging the original character and structural elements of the winery’s barrel room and cellars, the Tasting House preserves Argyle’s unique history. Argyle has evolved alongside the Willamette Valley and its visitors; from modest beginnings in the early days to a blossoming destination for world class wines that caters to a sophisticated crowd. To commemorate the opening of the new Tasting House Argyle has released a limited edition Sparkling wine, the 2011 Conducere. The innovative packaging of Conducere, named from the Latin verb meaning “to bring together or join together,” depicts the light-hearted migration from Argyle’s archival vintages, to the quiet confidence of new labeling. Argyle’s Conducere provides passage from the past to the future, and toasts the Tasting House, where Argyle wines have been made since 1987. The wine is made from 100% Chardonnay from the Dundee Hills. Argyle crafts a wide variety of wines (Pinot Noir, Riesling, and Chardonnay), including the vintage-dated sparkling wines, prized for masterful execution. Argyle founder, Rollin Soles, emphasized the winery be a “Grower First” focusing on farming grapes for sparkling wine, securing Argyle’s position as an innovator and trendsetter, and leading the sparkling wine movement in Oregon. Soles shared his passion for sparkling wine with head winemaker Nate Klostermann, ensuring the second generation of Argyle winemaking would continue to exceed standards in the sparkling wine industry. The founding identity at Argyle has always been guided by a spirit of evolution and reinvention. Much like the refined label and next generation of winemakers, the Tasting House is the next step in Argyle’s story. Visit now: the new Argyle Tasting House is located at 691 Highway 99W in Dundee, Oregon. Three different tasting flights are available from 11 a.m. to 5 p.m.